Money saving opportunities are available everywhere in our family home. We as parents need to be strategic and creative when it comes to our everyday spending. It is no secret that children grow out of their clothes faster than they can wear them out. Buying their clothing can get very costly overtime. So what can we do as parents to help offset these costs. 1. Purchase gently used items from thrift shops, yard sales, and consignment stores. Once upon a child is a consignment store, which has good quality used clothing. They will also buy back the clothing once your child is finished with it, although they are very selective in what they will take back. 2. Purchase gender neutral clothing. Yellows, greens, and whites can work easily for both girls and boys. Even blues can work easily for both genders. 3. Skip the cute stuff that is often highly over priced. For the time they will be in these clothes it really is not worth the extra spending. Most little kids clothes are cute anyway, even on the inexpensive side. 4. Do not buy snug fitting clothes. Buy one size up to allow a little extra wearing time. While this may not work so easily for pants it will for shirts, sweaters, and pajamas. These are usually more comfortable anyway when they are a little bigger fit. 5. Purchase clothing one season ahead. Department stores such as Walmart have really great end of season clearance sales. Why not buy some outfits a size or two larger for a huge fraction of the cost. 6. Buy online. There are many discount clothing stores online and many offer free shipping for a minimum purchase. Ebay also has sellers who will action off new clothing, allowing for great buys. 7. Organize or participate in a clothing swap. All moms will meet in one place and bring their children's outgrown clothes. Moms can then trade clothes with other moms. 8. Make your own. Some items such as pajamas, sweaters, and little dresses are not so difficult to make. - line dry clothes whenever possible. - pants that have become short can be made into a pair of capris or shorts. How do you save money on children's clothing? I was always very tall, and as a kid, I grew really fast so almost all my jeans were turned into shorts eventually! 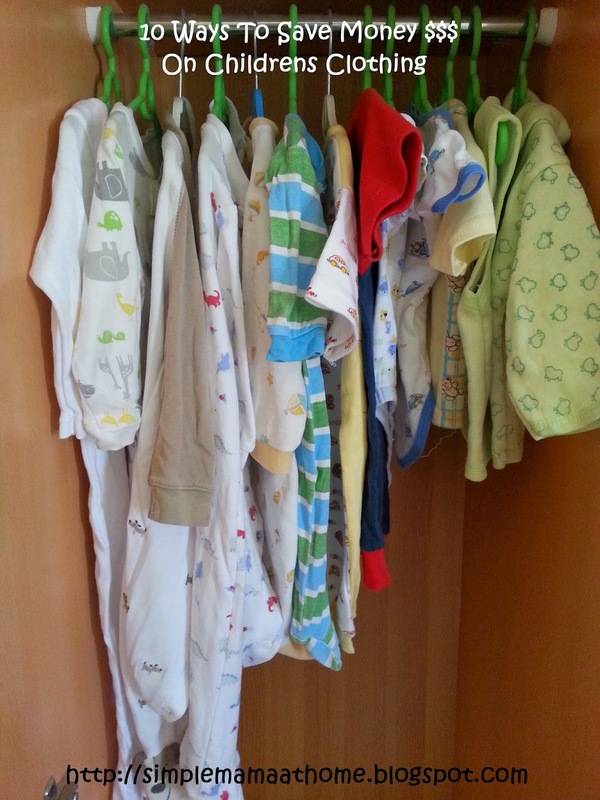 I have so much clothing for my son from when he was little and my best advice is to count how many pants, shirts and pjs you have and set a limit. Just cause there is a great deal out there on a shirt doesn't mean you need it. Now that he is five, we have a better system at the end of the season we pulled out the next season and count. We counted and tried on the summer clothes to figure out what still fit and then realized we didn't need anything else because we got last years big enough. We did need anything at the consignment sale because we were already all set!!! These are really great tips. I have a few friends who just had babies so this is definitely a post I'll pass along to them. Some really great tips and ideas here. I've been following a lot of local sale groups on Facebook too in case I see something worth snagging! Great tips! As a mommy of 9 I tend to do most of these. And definitely make sure to pass them on when you're through with them! As a mom of three boys. I purchase good quality clothing in the off season. Jeans such as levi's may cost more put they are able to be passed down so I get my money's worth. The great thing about jeans is that they will never go out of style especially when it comes to boys! I love that my mom is a seamstress. She has turned several of my husband's old shirts into pajamas for our daughters.